Senate President Pro Tem Martin Looney with, from left, Reps. Toni Walker, Jason Rojas, Matt Ritter, Joe Aresimowicz and Sen. Bob Duff. Connecticut House and Senate Democrats, seemingly adrift in recent years over how to respond to a stagnant economy and electoral losses, signaled Tuesday they have chosen a path for the 2018 session and campaign, releasing a “values agenda” committing to progressive favorites such as pay equity, a livable wage and paid family medical leave. Tensions over finding votes to pass budgets in the closely divided legislature had produced a measure of timidity in a Democratic leadership jolted by the steady electoral gains of Republicans since 2010 and stung by accusations that the General Assembly had grown deaf to the needs of business. House Majority Leader Matt Ritter, D-Hartford, said the political environment has changed in the year since Donald J. Trump took office, saying he sees “a groundswell of support” among women for issues such as pay equity and paid family medical leave, as well as a demand for a higher minimum wage as corporate taxes are being slashed in Washington. None of those issues came to a vote in Hartford last year, frustrating many rank-and-file Democrats, particularly women. The two Democratic caucuses, which have clashed over tactics and priorities at times, presented a united front Tuesday on the eve of the first day of the legislative session, a three-month sprint in election years that historically focuses on revisions to the state’s two-year budgets and efforts by both parties to frame their campaign messages. The agenda is the product of weeks of talks by House and Senate Democrats. Some of the items are new and barely more than talking points, such as a promise to make community college tuition-free for Connecticut residents. “This is a strong and progressive agenda that embraces our Democratic values,” said Senate President Pro Tem Martin M. Looney, D-New Haven. Senate Republican leader Len Fasano of North Haven said proposals for any significant new spending were laughable, given the state’s struggle to close a deficit in the current year and avoid larger shortfalls in coming years. Sen. Mae Flexer, flanked by House Majority Leader Matt Ritter and House Speaker Joe Aresimowicz. The Democratic caucus leaders are all males, but women were featured at the press conference. 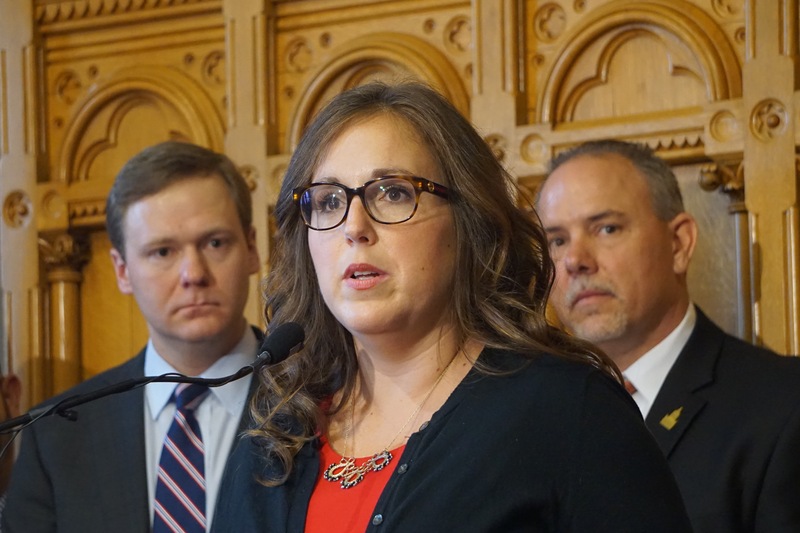 Sen. Mae Flexer, D-Killingly, said there was a palpable relief among her colleagues at the leadership’s becoming more aggressive. Their agenda is not entirely hostile to business, promising an overhaul of the school-to-workplace pipeline, a concern for advanced manufacturers like Pratt & Whitney, Sikorsky and Electric Boat, which have backlogs of orders but often struggle to find skilled workers. But overall, it drew a far more cautious reaction from business than from the Working Families Party, a labor offshoot that has been pushing for passage of a higher minimum wage and paid family medical leave. 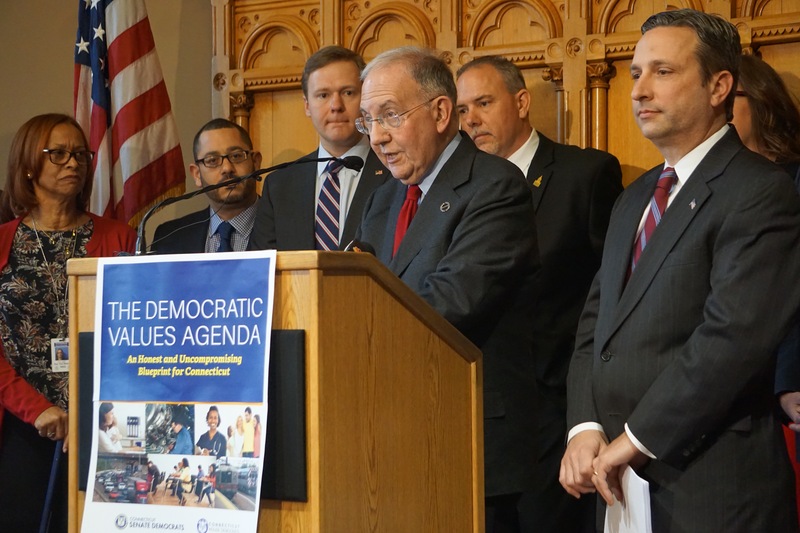 The Democrats’ press conference came the same day as the union, SEIU, released a poll of Connecticut voters showing strong support for paid family medical leave, tuition-free college and, to a lesser extent, a $15 minimum wage. Andrew Markowski of the The National Federation of Independent Business, which represents small businesses, said he appreciated some of the Democrats’ pro-jobs rhetoric, but not their proposals. Brian Flaherty, its vice president for government affairs, said CBIA was encouraged by the Democrats’ call for a more effective jobs pipeline, saying filling manufacturing jobs is the way to promote a living wage. The state ended 2017 with a net gain of 7,700 jobs, with more than half of them at manufacturers, he said. “What they need to do is keep the growth going,’ Flaherty said. CBIA made its strongest push to shape legislative elections in 2016, making independent expenditures that favored Republicans. Key aspects of the new agenda — including a higher minimum wage, a bill promoting pay equity by barring employers from asking applicants about pay history, and a paid family medical leave program — traditionally have been opposed by CBIA. “It looks like they are looking to build a legislative Democratic brand, much as the legislative Republicans have done for years,” Flaherty said. Legislative Republicans sank to irrelevance in 2008 after losing two-thirds of the seats in the Senate and three-quarters in the House. Stressing fiscal discipline and economic growth, they’ve rebounded from 37 House seats in the House to winning 72 in 2016, just four short of a majority. The GOP has picked up six seats in the Senate for an 18-18 split. One measure of the GOP’s new strength was asserting a role breaking a budget impasse last year, helping to deliver a bipartisan budget in late October, nearly three months after the start of the fiscal year. The defection of several rank-and-file Democrats on the budget forced the Democratic leaders to negotiate a compromise with Republicans. A page from an SEIU poll released the same day as the Democrats\’ press conference.